It’s time for this month’s Food ‘n Flix – the club where participants watch the selected movie, get inspired, & head to the kitchen! This month’s movie is Krampus, hosted by Heather at All Roads Lead to the Kitchen. 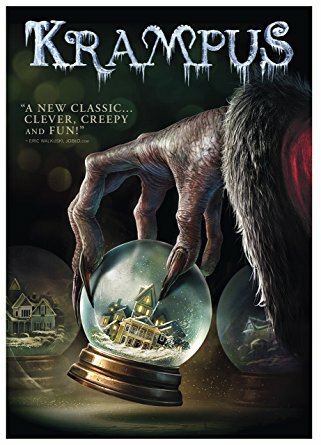 So I set out to find Krampus, having never heard of it. And I noticed that it was promoted as being a comedy-horror. Let’s take a look at the synopsis, then, ok? Let’s rewind a bit to my Beetlejuice post, when I mentioned the multiple reassurances I needed from Hubs that Beetlejuice wouldn’t give me nightmares (he was right, it was fine) and you can understand my reaction to the so-called comedy horror. I was completely perplexed by the thought of comedy+horror. Hubs told me that pretty much ever horror film is pretty much a comedy, because really, who runs up the stairs to answer the phone when there’s an ax murderer on the loose? It’s so ridiculous it’s almost funny! Ummm…yeah. Sorry, I’m too busy being terrified and having nightmares for the next month to catch the humor there. So, uh, I didn’t watch the movie. I goggled some still shots and decided that it looked way to terrifying and I just couldn’t! Since I love making gingerbread men at Christmastime (Ugly Sweater Hipsters are my favorite!) I decided to save a few aside and make that scary little guy! Pipe the details onto the gingerbread man using the royal icing. 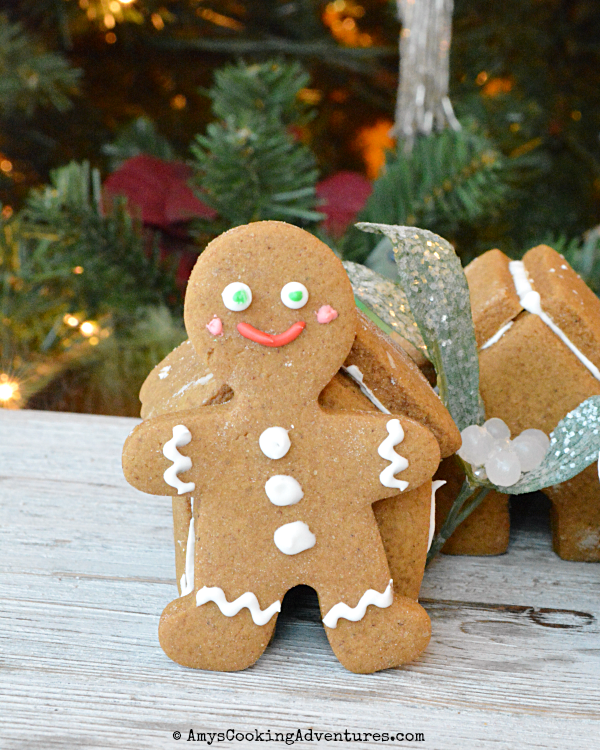 Use a small amount of icing to glue the candy cane to the gingerbread man. Melt the butterscotch candies in the microwave or oven. 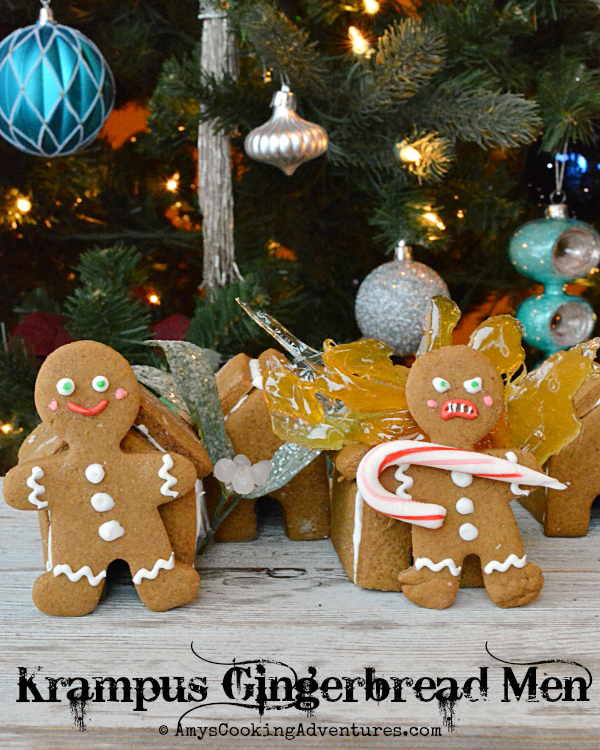 Quickly spread the melted candy onto a silicone mat or waxed paper in a flame pattern, quickly center the gingerbread man while the candy is still warm so the gingerbread man sticks. Allow the candy to cool before lifting the gingerbread man. 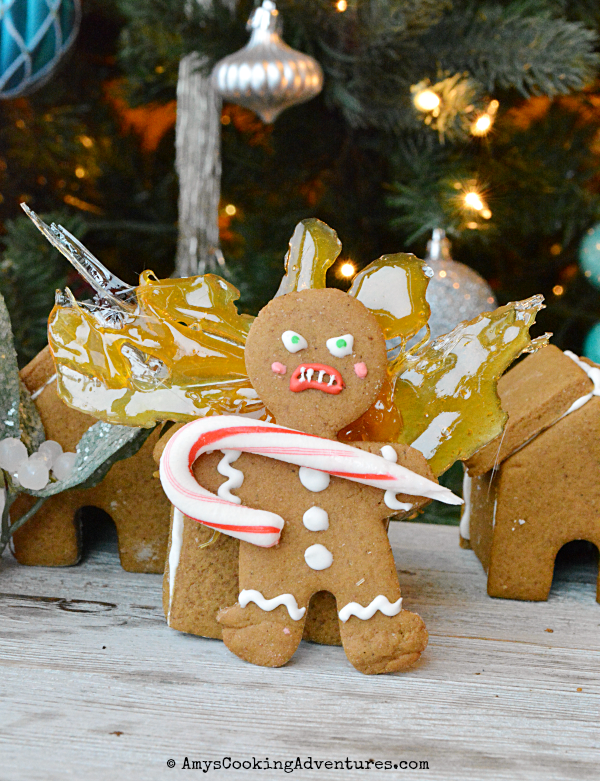 The gingerbread men are some of the best inspiration from Krampus. These look adorable - so much fun! 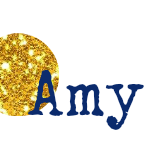 I did watch the movie Amy and you didn't miss a thing....Your gingerbread men are great though. My husband reassured me that Krampus would be funny- I fell for it and watched the whole thing. I didn't have nightmares, but I think the dog did (she likes to watch tv). 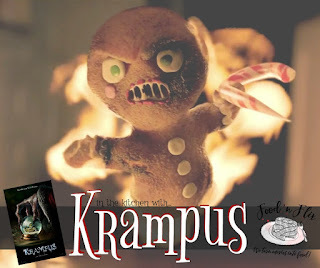 I love your gingerbread men - I think the best part of the movie for me was watching the little monsters catch on fire! That gingerbread man scene is my fave from the whole movie so I just find yours adorable. i was quite perplexed by the holiday horro concept but it was fun/different lol. I loved the movie (I found it too funny to be scary) and my favorite part was the gingerbread men, you had to laugh with that frosting dripping around the mouth! Your's is very cute! I guess I'm going to have to give 'sharpening candy canes' a shot!